I tried created a very simple cron task that echo's "Hello World" into a file named /tmp/example.txt. Also in the screenshot, you can see the date. I have also tried getting the exact date in the cron task (e.g. : 28 23 29 11 4), but that didn't work either. I am logged in as a super user. I have permissions to read/write/execute all of these files. I'm not really sure what I'm doing wrong. To check if the daemon is running, try service cron status or systemctl status cron (the service manager depends on your distribution). The daemon may also be called something slightly different, like crond or cronie. If it's not running, start it (replace status with start). If it's running, proceed to check the relevant log files to see whether the job was actually run. Depending on your distribution, this might be logged to /var/log/syslog, /var/log/messages, a daemon-specific file like /var/log/cron, or a systemd binary log file (journalctl -u cron to view). You should see a line for each execution of the job. When testing crontabs, set an execution time that's more than one minute in the future. Some cron implementations "pre-plan" what tasks to run, i.e. they'll decide at 12:33:00 what to run at 12:34:00, so you'll miss the window of opportunity if you add a 34 12 … cronjob at 12:33:30. If the job runs but doesn't produce the expected result, try running the command from the crontab manually, as the same user, with the same shell (usually the minimalistic /bin/sh). One common pitfall (though not the case here) are % characters in the command: they are treated specially by cron and need to be escaped (\%) to be seen by the actual command invocation. Most cron implementations also send the output (if any) of each cronjob as an email. If you haven't set up mail delivery over the internet, those mails should be stored locally and be readable using the mail command. Your biggest problem is that /bin/bash echo "Hello World" is not a valid command. It looks for a script called echo. Try /bin/bash -c 'echo "Hello World"' instead. The second problem is that you should specify an absolute pathname for pingstuff. See also Ubuntu 14.04, 16.04, 18.04 Cron job doesn't execute, although it probably isn't related. applies to user crontabs. These are edited with crontab -e.
which has the additional user column, applies to the system-wide crontab file /etc/crontab. So, since you're editing the crontab file with crontab -e, you shouldn't specify a username as the sixth field. 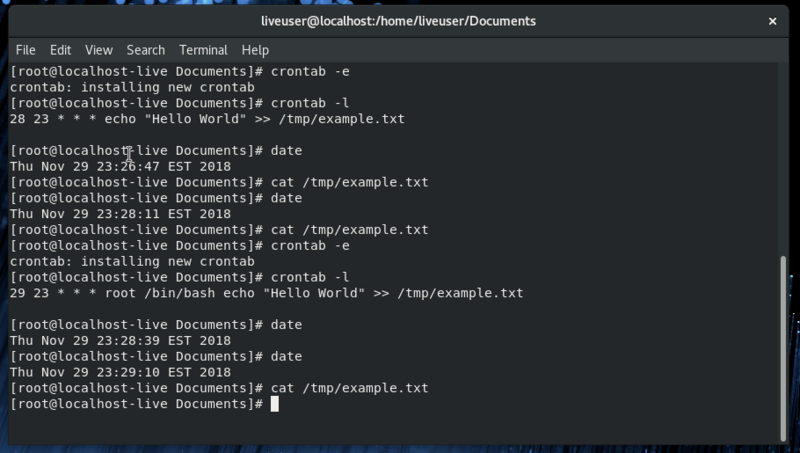 cron will know to run the command as root because you were root when you ran crontab -e, and, if you enter "root" as the sixth field, cron will try to execute a program called root. Note, however, that cron runs the commands in a shell. Also, in the second example, you are starting the shell explicitly. Have you tried that command on your interactive shell? Note that the redirection should be done in the crontab, not within the script (just a style-guide). Save that as helloworld.sh in any directory, make it executable (chmod +x helloworld.sh) and call this script in your crontab. Take care if you use the user crontab or the system-wide crontab. Not the answer you're looking for? Browse other questions tagged linux bash cron or ask your own question. Why cron not outputting to file?